Click on a product for more information..
Sausalito Art Festival, Sausalito, California. Second Place Award, wood, 2003. St. Charles Fine Art Show, St. Charles, IL. Judges Choice, Overall Best of Show based on a single piece of work, 2011, 2009. Hidden Glen Art Festival, Olathe, KS. Merit Award, 2010. Lincolnshire Art Festival, Lincolnshire, IL. Best of 3-D Functional, 2014, 2012, 2011, 2010, 2009, 2008, 2004. St. Charles Fine Art Show, St. Charles, IL, featured artist for show poster, 2010. One of a Kind Show, Chicago, IL. Third Place Award, wood, 2001. Art at the Glen Town Center, Glenview, IL. Merit Award, 3-D Functional, 2005. Lincolnshire Art Festival, Lincolnshire, IL. Merit Award 3-DF, 2007, 2006, 2003. Chicago Botanic Garden Art Festival, Best of Show Award, wood, 2002. College Hill Art Festival, Cedar Falls, Iowa. Award of Excellence, 1994, 1992, 1991, 1990. Art In Your Eye, Batavia, IL. Honorable Mention Award, overall show, 2013. Midwest Salute to the Masters, St. Louis, Missouri: Award of Merit, 1991. Promenade of Art, Arlington Heights, Illinois. Best of Show award, wood, 2004. Ann Arbor State Street Area Art Fair, Best of Show Award, 1999. Uptown Art Fair, Minneapolis, MN Honors Award , 2000, 1999, 1996, 1994, 1993, 1991, 1990, 1988. Promenade of Art, Arlington Heights, IL. Merit Award, 2005. Art and Air, Webster Groves, MO. Best of Show, wood/metal category, 2012, 2010. Cantigney Art Festival, Wheaton, IL. 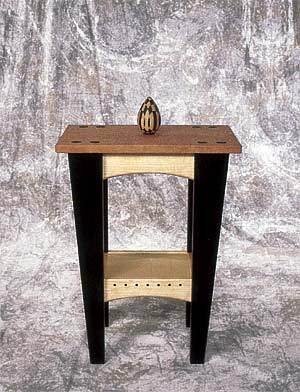 Best of Show Award, wood, 2002. Sausalito Art Festival, Sausalito, California. Best of Show Award, wood, 2002. Featured cover artist for the Waterloo-Cedar Falls Symphony concert program, 2008. Downer’s Grove Art Fair, Downer’s Grove, IL. Outstanding Achievement Award, 2013. Joliet Salute to the Masters, Joliet, IL. Best of 3-DF, 2007. Suburban Fine Arts Festival, Highland Park, IL. Best of Show Award, wood, 2002. Art in the Park, Columbia, MO. Second Place, overall show, 2015. 42nd Annual Edina Art Fair, Edina, MN. Award of Excellence, wood, 2008. Promenade of Art, Arlington Heights, IL. Merit Award, 3-dimensional wood, 2003. Uptown Art Fair, Minneapolis, MN, Best of Show Award, 2013, 2011, 1997, 1986. Arts in Bartlett, Bartlett. IL. Award of Excellence, 2009. Arts and Riverwoods, Riverwoods, IL. Best of Fine Craft, 2001. National Clock Design Competition, Honorable Mention Award, 1996. Lakeview East Fine Arts Festival, Chicago, IL. Best of 3DF, 2006. Downers Grove Art Festival, Downers Grove, IL. Best of 3-D Functional, 2014, 2012. Laumeier Art Fair, St. Louis, MO. Honorable Mention, overall show, 2013. Des Moines Art Festival, Des Moines, Iowa, Best of Show Award, 1998. Greater St. Louis Art Association, St. Louis, Missouri: Award of Merit, 1990. Chicago Botanic Garden Festival, Outstanding Achievement Award, 2011. Minnesota Crafts Council Twin Cities Market 2003, St. Paul, MN. Second Place Award, overall show, 2003. Art on the Square, Belleville, Illinois. Best of Show, wood, 2015. Metris Uptown Art Fair Finalist Award, 2003. Ann Arbor State Street Area Art Fair, Ann Arbor, MI. Honorable Mention Award, 3-D category, 2004. Art in the Park, Highland, IL. Best of Show, overall show, 2014. Port Clinton Art Festival, Highland Park, IL. Outstanding Achievement Award, 2014. St. Charles Art Show, St. Charles, IL. Purchase Award, 2008, 2007. St. Charles Fine Art Show, St. Charles, IL. Best of Show 3-D, 2007. Artsarben, Omaha, NE. Honorable Mention Award, overall show, 2013.